The Hawaiian Islands, part of a much longer chain of oceanic islands and seamounts called the Hawaiian-Emperor Chain, is comprised of 8 principal islands and 124 islets, shoals, atolls, seamounts and banks, all volcanic in origin. 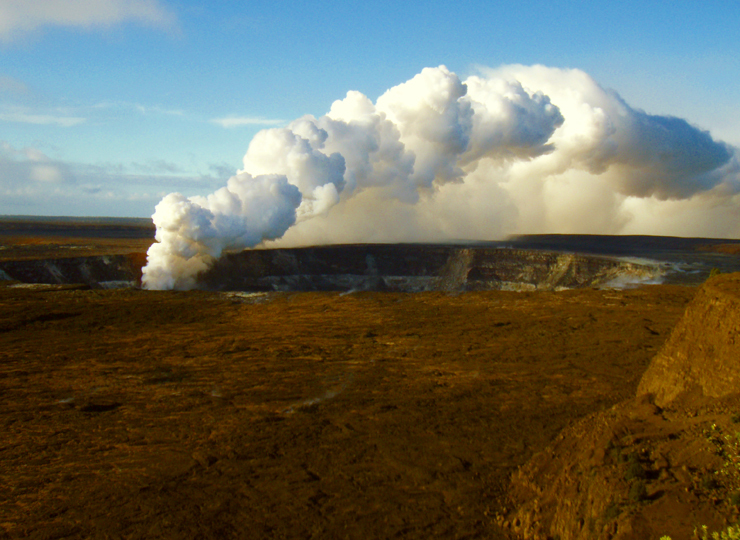 The Hawaiian Islands proper extend from Kure Atoll in the mid-Pacific, trending southeast to Hawaii Island (the Big Island) and Lo’ihi submarine volcano. The eight major islands of the Hawaiian chain are named, from northwest to southeast, Ni’ihau, Kauai, O`ahu, Moloka`i, Lana`i, Kaho`olawe, Maui, and Hawai`i. 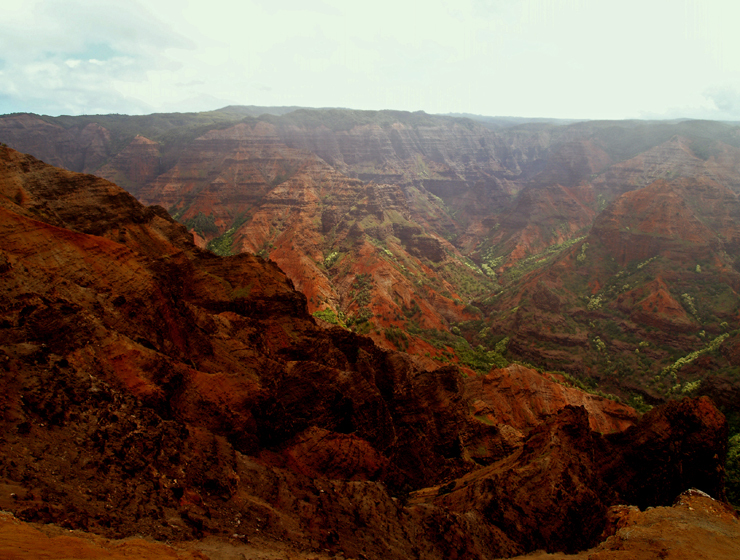 Unraveling the geologic history of the Hawaiian Islands provides a fascinating glimpse into structures and process occurring deep within our Earth. To understand how the Hawaiian Islands were formed, let’s review a bit about the nature of our planet. Layered like an onion, our seeming solid earth is actually a heaving mass composed of various solid, partially-molten, semi-plastic and liquid layers. The solid crust (or lithosphere), which covers the entire surface of the earth, seems strong and robust but is, in fact, quite thin and malleable. About the same thickness relative to the rest of the planet as an onion skin is to an onion, the Earth’s silica-rich crust more or less floats upon a much thicker, partially molten, more iron and magnesium-rich, semi-plastic layer of much hotter material called the “mantle”. Below the mantle are the liquid outer core and the solid inner core of the Earth. Earth’s crust comes in basically two varieties, oceanic crust which is quite thin (only 5-7 km thick) and continental crust, which is much thicker than oceanic crust (up to 200 km thick). Oceanic crust is composed almost wholly of an effusive volcanic rock type called “basalt”, its intrusive volcanic, subsurface equivalent called “gabbro” and a thin covering of sediment. The continental crust, which underlies the seven continents and the more massive islands, and upon which most human activity takes place, on the other hand, is composed not only of basalt and gabbro, but all the other rock types as well. Continental crust is much less dense than oceanic crust, being much more silica-rich, and therefore is more buoyant on the mantle. This, in part, accounts for its relative thickness and higher elevation compared to the denser, thinner oceanic crust. The Earth’s crust is further divided-up into various distinct pieces, called “tectonic plates”, all moving relative to each other. Plates are composed almost wholly of either oceanic or continental crustal material. These plates “float” on the semi-plastic mantle, and are carried along by currents on the mantle’s surface. Mantle currents are caused by various physical process of heat transport within the mantle. Think of a pot of boiling soup; the point of the boil in the soup is analogous to the heat transfer in the mantle and the skim of chilled soup riding around on the surface is analogous to the moving tectonic plates carried on top of the mantle. Interactions along the edges of these plates, whether slipping past each other (such as along the San Andreas Fault), one riding up over another (such as beneath the Himalayan Mountains), or one being subducted beneath the other (such as along the western edge of North America), accounts for much of the earthquake, mountain-building and volcanic activity seen on the surface of the earth, and plate margins are certainly the most geologically active places on earth. 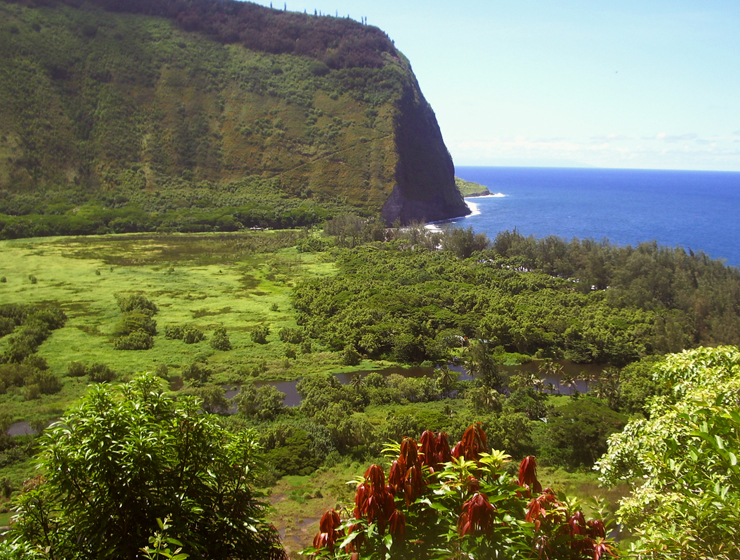 Occasionally, exceptions to this generality occur, and the Hawaiian Islands are one such spectacular exception. 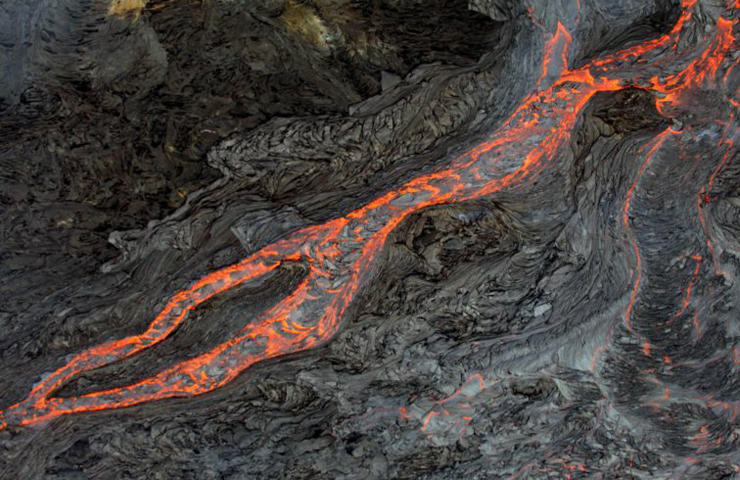 To understand the forces and process which shape the Hawaiian Islands, we must look a little closer at the origin and movement of the crust and the structure of the mantle. Happily, we need only concern ourselves with oceanic crust in general and the Pacific Plate in particular, as well as one, singular feature of the mantle. Oceanic crust is continually created by volcanic action along giant ridges which run generally north-south down the middle of the ocean basins. The hot liquid magma at the ridges is much less dense than the surrounding, cold crustal rocks, and so “floats” these ridges and the still hot, newly-formed oceanic crust, up above the surrounding ocean basin, thus forming the ridge. As volcanic eruptions along these ridges add hot, new material to the edge of the oceanic plates, the mass of new material drives the older oceanic crust away from the ridge, down both sides of it. As the new material cools and becomes less dense, it sinks and further drives the crust away from the ridges. Called “Mid-Ocean Ridge Spreading”, this process can be likened to a conveyor belt where new crust is created at the mid-ocean ridge, and is driven along by buoyancy and gravity, farther and farther away from the ridge until the plate’s leading edge interacts in some way with another tectonic plate. Thus we see that the floors of the ocean basins, all around the world, are in constant, relative motion. 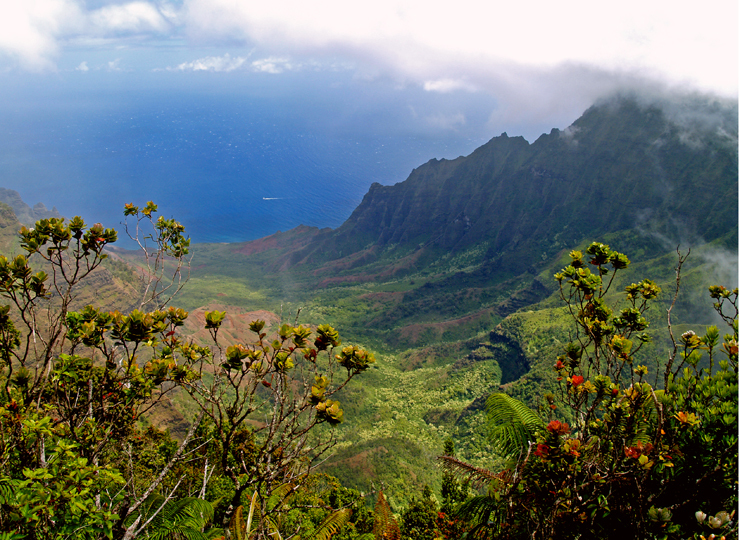 The Pacific Plate, upon which the Hawaiian Islands are built, has been moving at a rate of about 3.9 inches per year to the northwest, relative to other plate motions, for about the last 42 million years. 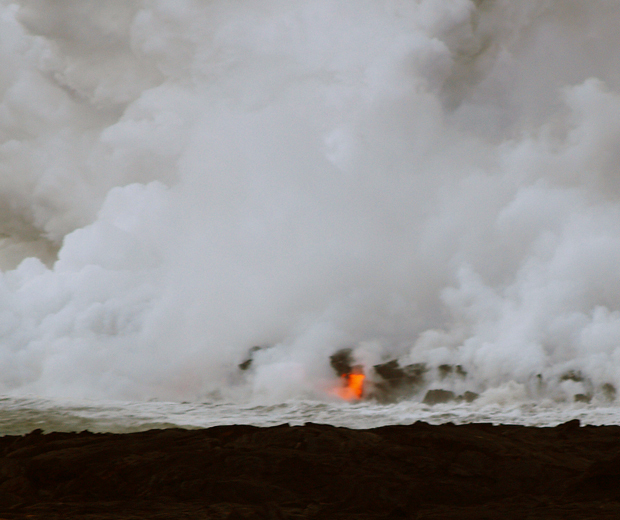 But what causes the enormous volcanoes that comprise the Hawaiian Archipelago to form in the middle of the ocean basin? As mentioned above, the mantle is far from uniform either compositionally, thermally or in terms of the processes controlling its internal motions. There are places on the earth where, for a variety of reasons, hot and buoyant mantle plumes rise above the general surface of the mantle, into the crust, carrying great amounts of heat and semi-liquid material quite near the earth’s surface. 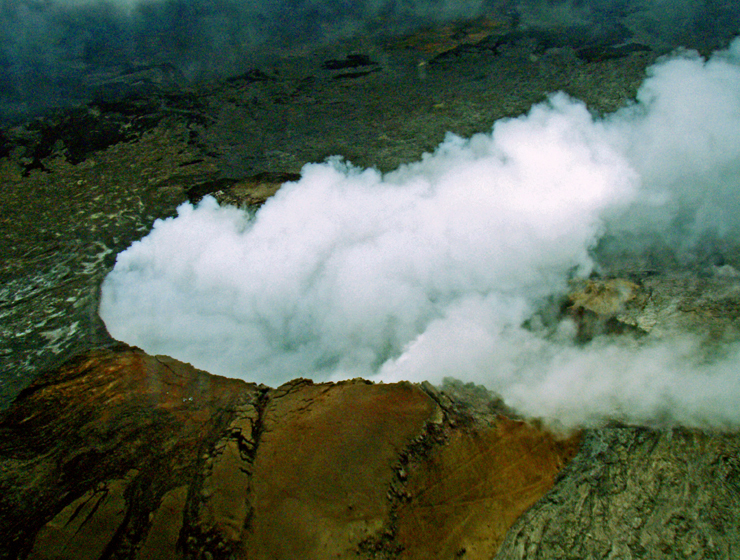 Called “Hot Spots”, extreme volcanism can result from these thermal plumes. 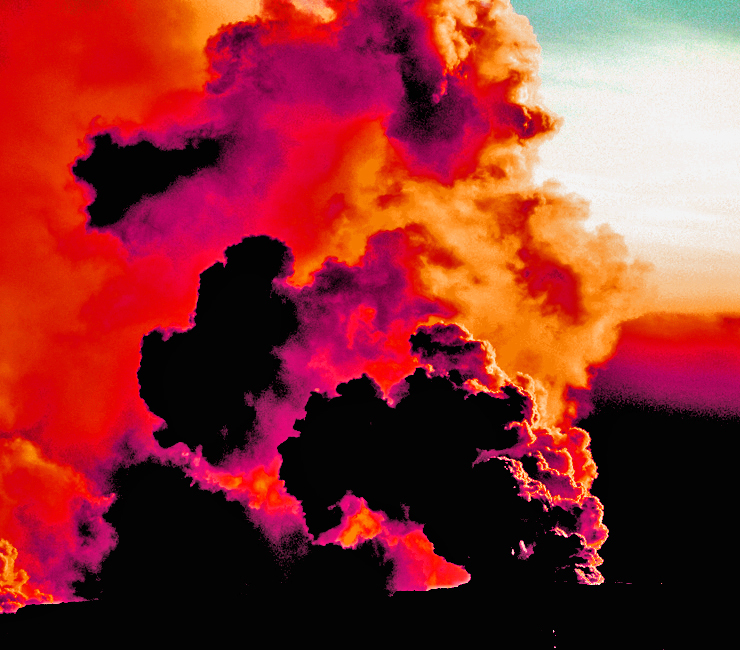 The volcanic fields at Yellowstone in North America are one such example of this “hot spot magmatism”; the Hawaiian Islands are yet another. 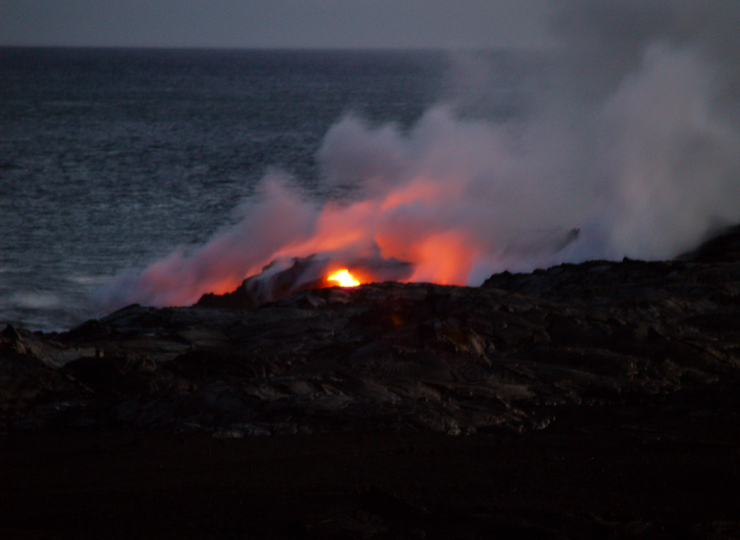 The Hawaiian Hot Spot has caused the creation of at least 129 volcanoes on the ocean floor, the center of volcanism on the Pacific Plate continually migrating across the plate as it travels over the hot spot. Of these 129 volcanoes, 123 are extinct, three are dormant and three are active. At first, the trend of volcanoes was almost due north-south. Then, somewhere between 41 and 43 million years ago the relative motion between the Pacific Plate and the hot spot changed, becoming more northwesterly; this caused a sharp bend in the line of island-forming volcanoes. Although all were formed by the same, continuing tectono-volcanic processes, two island groups are named from this bent line of islands, atolls and seamounts. North of the bend are the Emperor Seamounts, a long chain of islands, seamounts, atolls and reefs trending steeply southeast to northwest between Abbot Seamount in the mid-Pacific and Meiji Seamount near the Aleutian Trench. South of the bend are the Hawaiian Islands, trending from the active volcanism at the Big Island and Loihi Volcano today, gently northwest to Kure Atoll in the mid-Pacific. Movement of the Pacific Plate over the hotspot is such that Midway and Kure Atolls were where the Big Island is now, directly over the hot spot, about 30 million years ago. The chemical composition of the Hawaiian magmas plays a central role in determining the physical form of the Hawaiian Islands. All crustal rocks are formed of minerals composed of aluminum and silicon oxides with varying amounts of iron, magnesium, sodium, calcium, potassium and other elements stirred in. 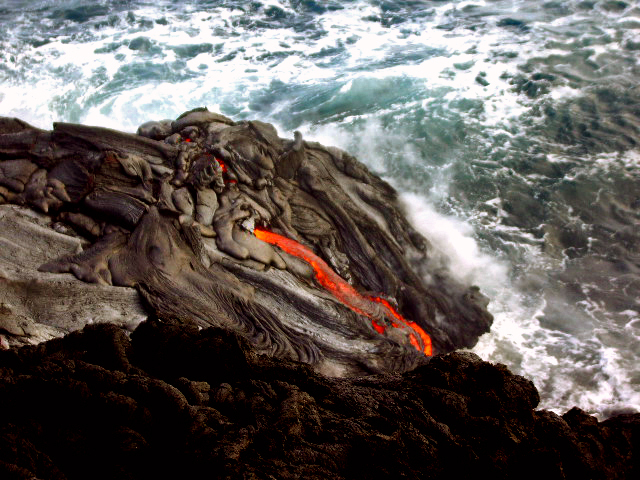 In lava, silica tends to polymerize and greatly increase the viscosity of the melt—thus silica-rich lavas are fairly “sticky”, forming slow moving lava flows that pile-up into steep volcanoes which are typified by explosive eruptions. Silica-poor melts, on the other hand, because they are not so polymerized, form very fluid lavas that flow quickly and easily, forming gently-sloped volcanoes typified by relatively quiescent eruptions. Remember the key words here are: “relatively quiescent”. One glance at the profile of the Hawaiian volcanoes is enough to convince us that the lavas must be very silica poor, since they are very gently-sloped and the eruptions relatively peaceable; certainly civilized enough so that the casual viewer may approach them quite closely in relative safety. 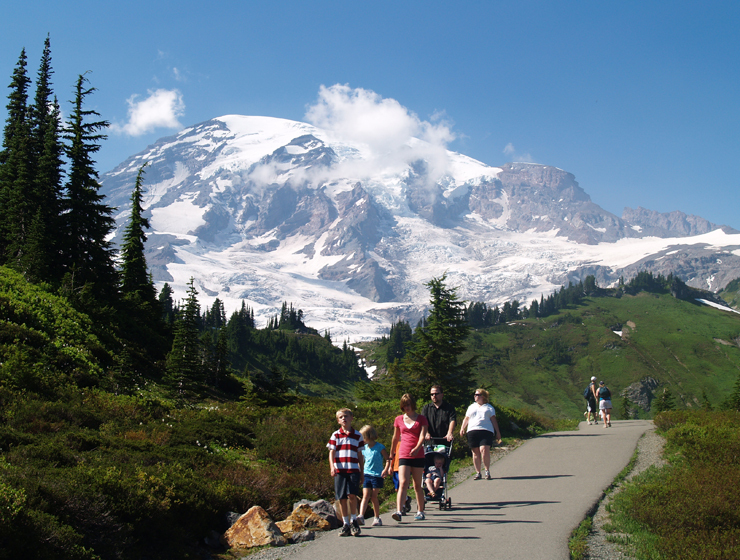 Compare these with the very steep-sided, highly explosive eruptions of volcanoes like Mt. St. Helens, which is comprised of lava much more intermediate in silica composition, or the smoking hole in the ground that is the Yellowstone volcanic field, left by a massively explosive, very silica rich (and very, very viscous) lava erupting. 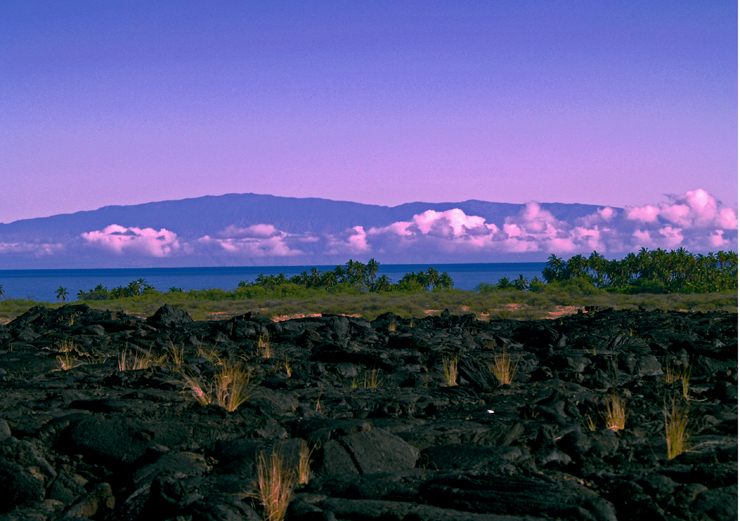 The rocks formed when the lava from Hawaiian volcanoes hardens are called “basalt”. Although you hear the term “lava rock” used by laymen, it is a nonsensical word geologically and the registered trademark of a commercial product. Commonly misapplied, it makes even less sense than the equivalent of using the term “water solid” instead of “ice”. The name “basalt” denotes both the silica-poor composition, as well as the fact that it was erupted onto, and it has cooled at, the Earth’s surface. When lavas cool within a magma chamber before being erupted onto the surface, they are called an “intrusive volcanic” rock; intrusive volcanic rocks formed from lavas of basalt-like composition are called “gabbros”. There are a few rocks in the Hawaiian islands of differing composition and texture than basalt and gabbro, but they are unimportant to this discussion. 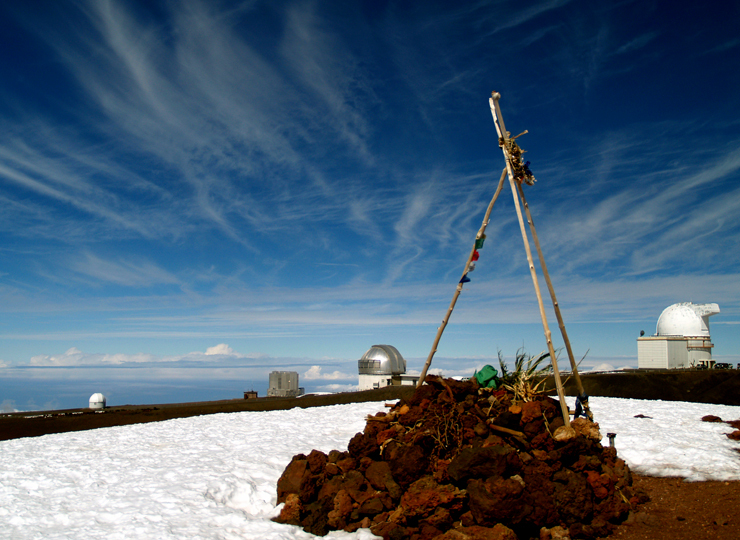 The angle of repose, which is controlled by the viscosity of the melt, is about 6 degrees for Hawaiian basalts. Melt viscosity is a function of its temperature, silica content and fluid composition. Hawaiian basalts are very fluid because of the low silica content and high eruptive temperature (in excess of 1100 degrees C); this low viscosity accounts for low angle, “shield shape” of Hawaiian volcanoes. As soon as the Hawaiian volcano forms, other forces begin to act upon it, affecting the general “shield shape” of the volcano: tides and waves attack the edges, rivers and streams begin to dissect the shield into ridges. As time goes on, erosion from surface water flow produces fluting along those ridges. 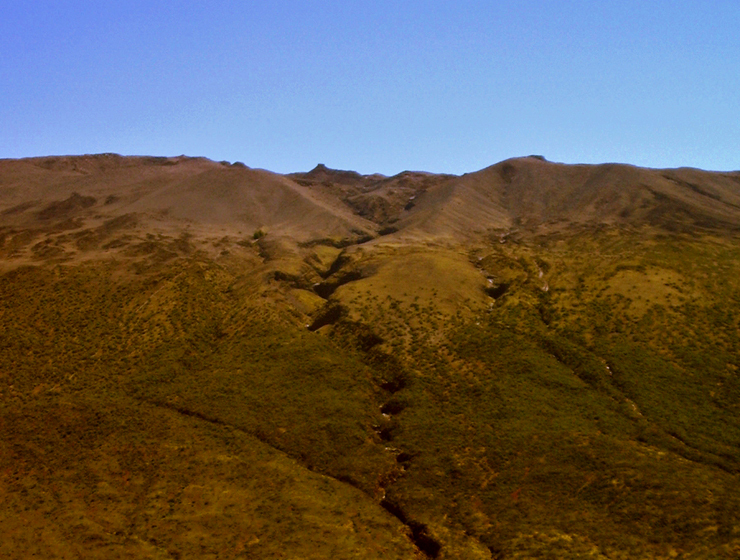 Great landslides produce enormous cliffs; faulting produces huge valleys and collapse produces enormous craters and calderas. 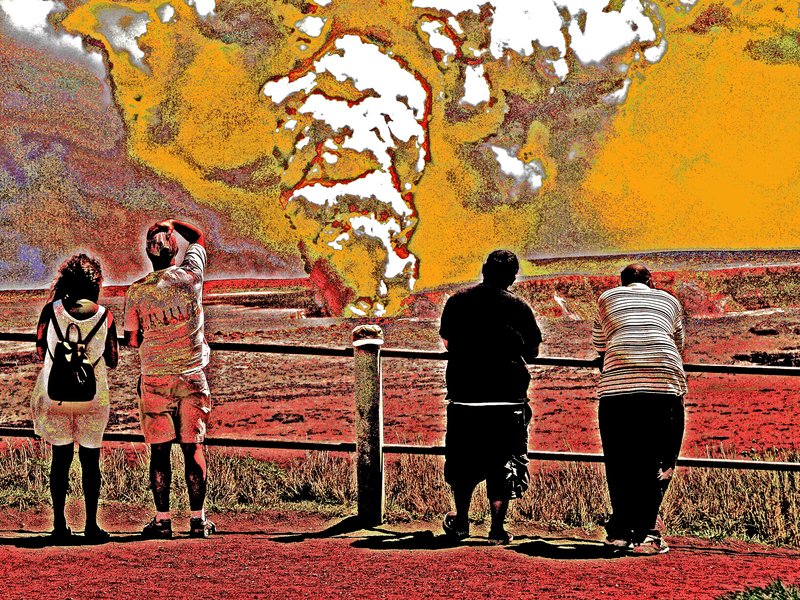 Further, the later stage of Hawaiian volcanism is typified by increasing violence, which makes deep explosion craters, steep-sided cinder cones and steeply sloped, but easily eroded, ash deposits. To look at the volcanoes of Hawaii starting in the southeast at Kilauea and Mauna Loa and moving northwest, one can see this evolution quite clearly. 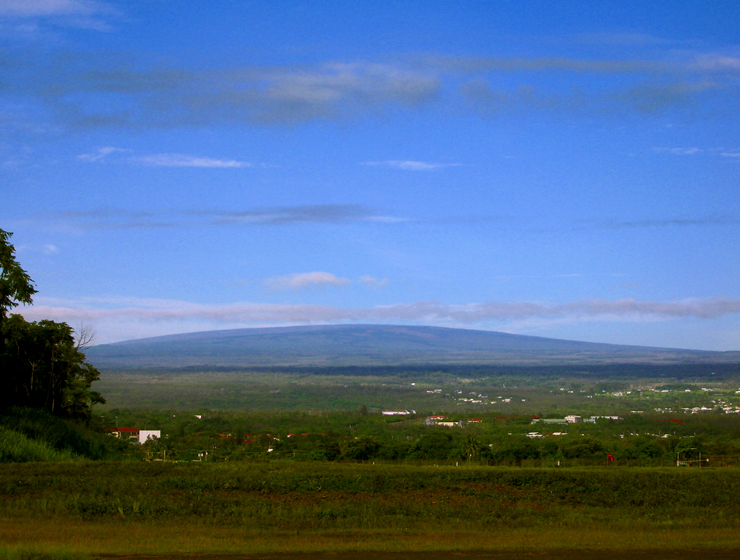 Kilauea and Mauna Loa, being quite young, are still broad and shallow-sloped, basically the classic shield-shape. 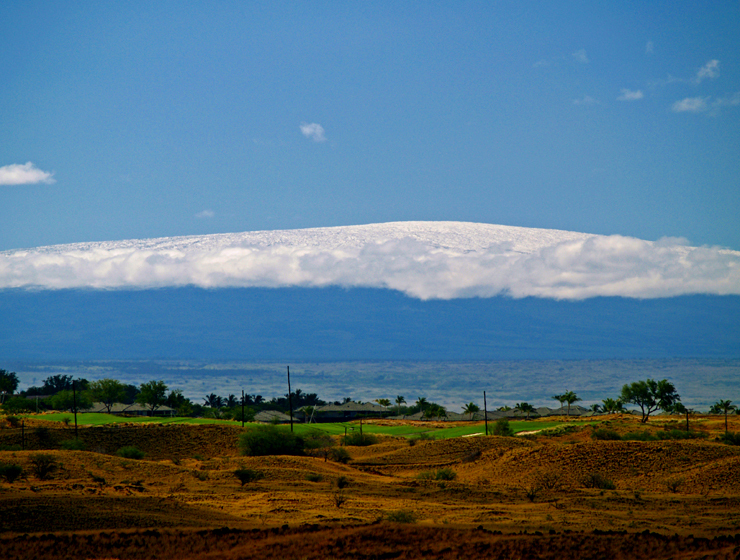 Mauna Kea and Hualalai are obviously more mature, showing steeper slopes, a reflection of greater ashfall and greater erosion, as well as pocked with explosion craters and cinder cones. 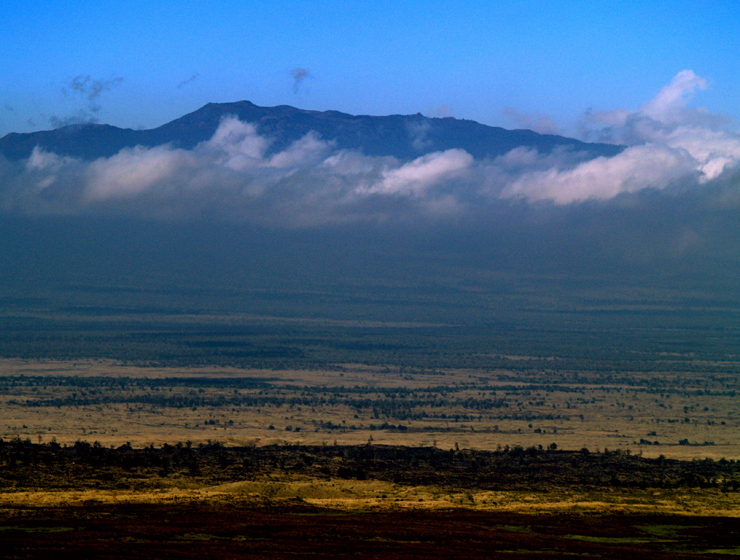 Moving father along, Kohala Mountain is so deeply eroded and festooned with long, fluted ridges as well as cut by enormous canyons, that it is almost unrecognizable as a shield volcano. And so it continues as one proceeds north through the older islands and the more highly eroded mountains; the original shield shape of the volcanoes become more and more obscured by deeper and deeper erosion. 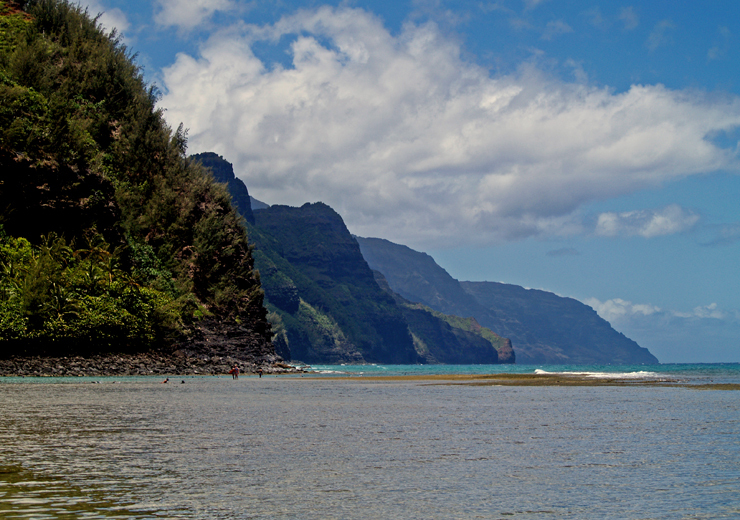 By the time one gets to the famous and spectacular Na Pali Cliffs of Kaua’i, all that is left of the original volcano are the deeply fluted, now almost knife-like, ridges. The great mass of these volcanoes causes them to begin to sink back into the mantle. This is evident on even relatively young volcanoes. 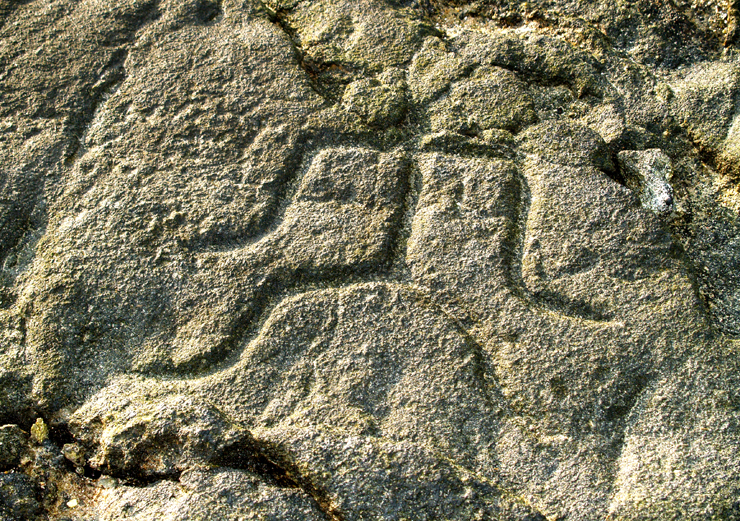 For instance, on the slopes of Hualalai Volcano on the Big Island, along the shore at Keauhou, numerous petroglyphs commemorating the famous victory of King Lonoikamakahiki of Hawaii over King Kamalalawalu of Maui were carved in the rock around the end of the 16th century. Although when they were originally carved they stood above sea level, in the intervening four centuries, the island has sunk sufficiently that they are now mostly awash in the sea and submerged at high tide. Another process, operative in the geologically recent past, has served to shape the slopes of the Hawaiian volcanoes, at least those which are or great height. 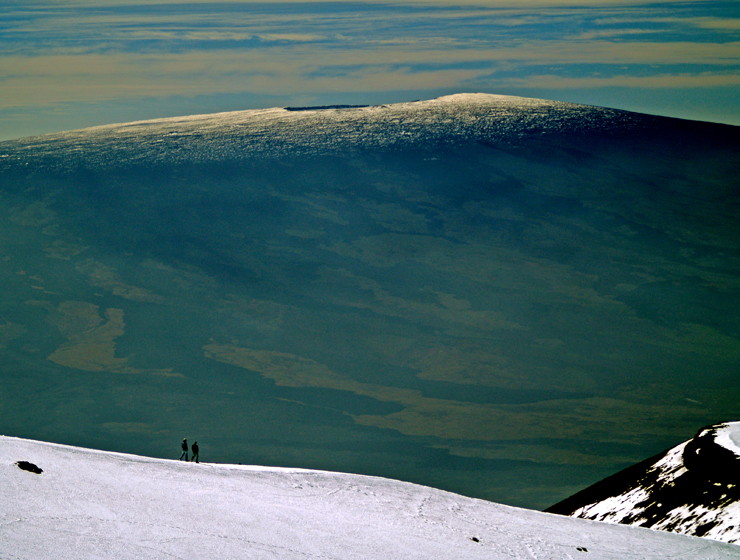 Glaciers covered the summit of Mauna Kea (and possibly Mauna Loa and Haleakala) three times between 200,000 and 13,000 years ago, leaving behind many glacial features such as cirques, u-shaped valleys and scoured bedrock; surviving into the present is a remnant rock glacier near the summit of Mauna Kea. The complex interaction of volcano growth, coalescing of various volcanoes forming a single island and the eventual subsidence of the volcanoes into the crust determines the shape and size of the individual Hawaiian Islands through time. Today, the youngest islands are largest and the oldest islands, generally, are the smallest…this trend continues throughout the Hawaii Island/Emperor Seamount chain. 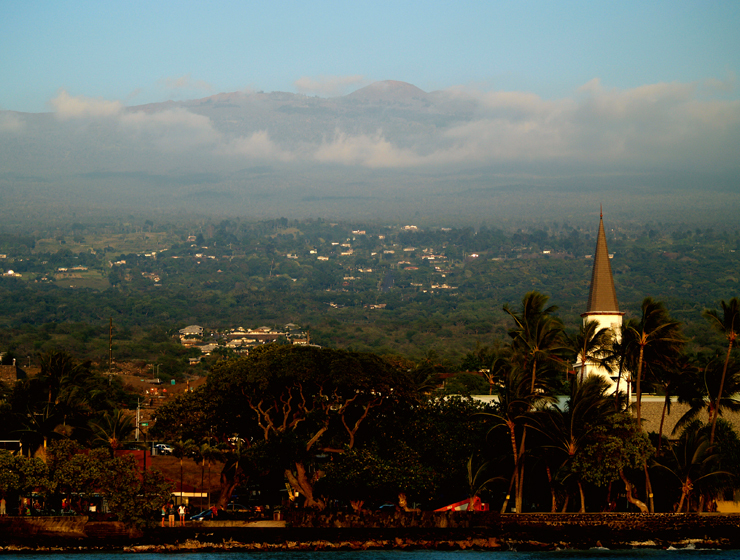 In the case of the Big Island, even though the first volcano to form, Mahukona, has completely subsided below sea level, the Big Island still comprises more than twice the area of all the other Hawaiian Islands combined, due to the large number of volcanic peaks forming it. However, through their history, all the Hawaiian Islands will experience the same pattern of growth, coalescence, subsidence and submersion, and so may have been much larger at one time. 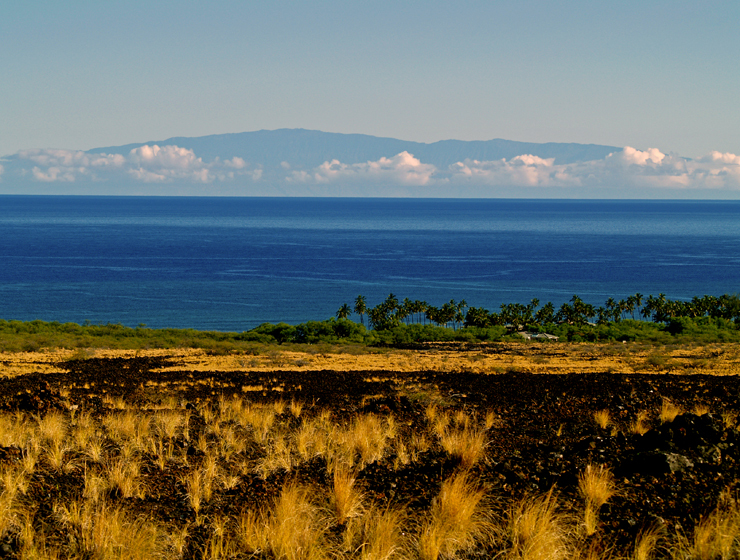 Maui, today comprised only of the remnant peaks of Haleakala and the West Maui Mountains, at one time formed a single giant landmass with the islands of Lana’i, Moloka’i, and Kaho’olawe. As the continual northwest movement of the Pacific Plate carried Maui away from the Hawaiian hot spot, continued subsidence submerged the larger landmass, known as Maui Nui, or “Big Maui”, into the oceanic crust, leaving only these four, very much smaller, islands above the surface today. 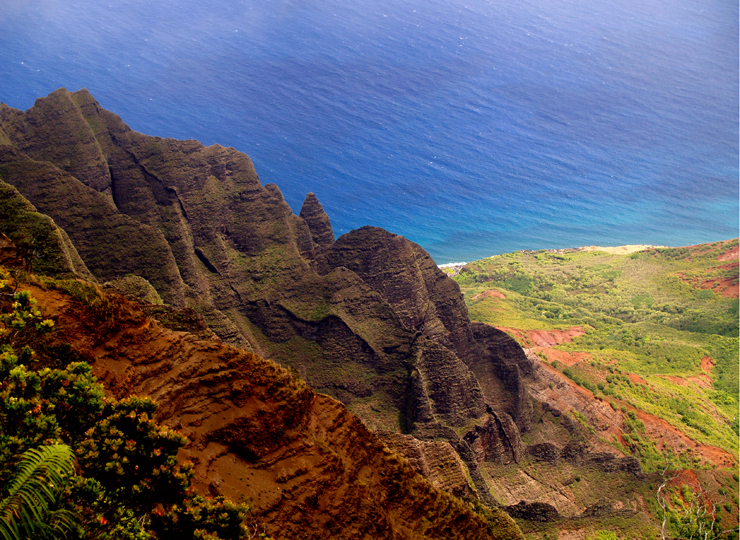 In fact, Kaua’i, Ni’ihau and O’ahu all represent the tiny remnants of once much larger landmasses that are actively subsiding into the oceanic crust. Tracing the Hawaiian Archipelago to the northwest, and thus to very much older islands, we see this evolution continue as the great volcanoes are completely submerged below the surface leaving only the fringing coral reefs and a tiny remnant island above sea level, such as we see at Laysan Atoll and Midway Island. Continuing along through the chain to the Emperor Seamounts, not even that much is left as all traces of these islands, once proud and beautiful like the Hawaiian Islands today, become totally submerged beneath the surface of the ocean. Add to this mental picture the fact that the Pacific Plate relentlessly drives northwestward, carrying all the Hawaiian-Emperor Chain with it, northward to the Aleutian Trench, where it is subducted and destroyed beneath the North American Plate. Eventually, in the far-distant future, this fate awaits all these beautiful, precious islands. Such is the ephemeral nature of the Hawaiian Islands, and this vision of their very delicate and temporary nature should make us respect and wonder at their splendor and beauty, all the more. And increase our desire to protect and preserve them.